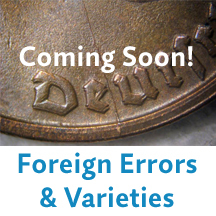 Do error and variety coins interest you? of other collectors who share your interest in this fascinating area of numismatics? • A subscription to the club’s award-winning journal Errorscope, published six times a year. 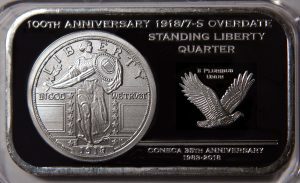 • A free U.S. variety coin (a re-punched mintmark or a doubled die) when you join. • A club membership card. the Annual Meeting, and the Cherrypickers’ Contest. • A discount on error and variety authentication and attribution services by club experts. 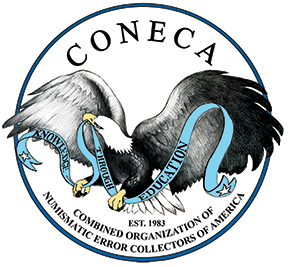 • Access to Members Only area of the CONECA Web site. — View electronic back issues of Errorscope from 2004 through the current issue. — Electronic issues from 1981 through 2003 will be added in the coming months making membership and web access a great value! — When joining or renewing please use the Thank You page you are redirected to after your Paypal payment to fill out the information there and to add a password that you would like to use for access to the Members Only area of the website. — Giving us password information through the secure Paypal page when you join will get you access quicker! You receive a copy of Errorscope by US Bulk Mail and online access to Errorscope. $25 per year. Your club receives a copy of Errorscope by U.S. Bulk Mail, but no online access to Errorscope. $25 per year. Adult Membership—U.S. First Class Mail. You receive a copy of Errorscope by U.S. First Class Mail and online access to Errorscope. $37.50 ($25 for the subscription + $12.50 postage) per year. You receive a copy of Errorscope by U.S. Mail and online access to Errorscope. $37.50 ($25 for the subscription + $12.50 postage) per year. You will only receive online access to Errorscope. $25.00 per year. Young Numismatist (under 18 years old)—Online Only. You receive online access to Errorscope, but no copy of Errorscope by mail (under 18 years old). $7.50 per year. Young Numismatist (under 18 years old). You receive a copy of Errorscope by U.S. Bulk Mail and online access to Errorscope. $17.50 per year. This includes one Adult Membership and one additional Membership in the same household. Additional Memberships in the family are $12.50 per person. Each member is entitled to all club privileges. However, the family will receive just one copy of Errorscope. Life membership—under age 55. $750. Life membership—55 years of age or over. $650. section of the Purchase Confirmation page. Print the membership application below and fill it out. can be downloaded and saved. The Microsoft Word document will automatically download to your computer.